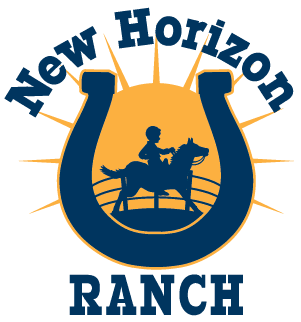 Serving individuals since 2007, it is the mission of New Horizon Ranch, to enrich the lives of individuals through equine assisted activities and therapies. It is our belief that every child is capable of greatness and we believe that horses can play an important role in that process! Riding and interaction with horses are not only fun, but create opportunities for kids to improve physical strength, relational skills, cognitive skills and communication. Our horse partners create a unique and motivating atmosphere where riders are encouraged to reach new levels of independence, responsibility and confidence. We take pride in our family oriented culture. Many parents have expressed that coming to New Horizon Ranch is the highlight of their child’s week. The entire family enjoys coming to The Ranch, because everyone is accepted here. Whether you are a volunteer, client, or family of a client, NHR is a breath of fresh air; it’s a place to take time, relax and enjoy the beauty of the horses and nature! NHR currently offers a variety of programs including Hippotherapy, Therapeutic Riding, Equine Assisted Learning, Equine Assisted Psychotherapy, and Summer Day Camp programs to individuals of all ages with physical, cognitive, social, emotional and learning disabilities.